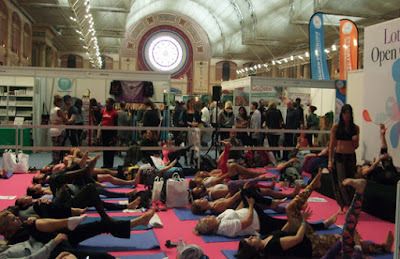 I went to the Mind Body Soul Experience in its new venue at Alexandra Palace yesterday and had a fabulous time. The change of venue has really improved the event. 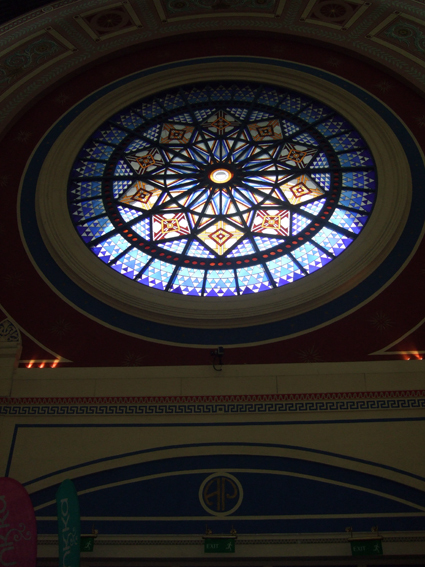 Alexandra Palace is one of London's great buildings, set in a huge park, which at the moment is beautiful in autumn colours, the so-called "People's Palace" is magnificent outside and in. 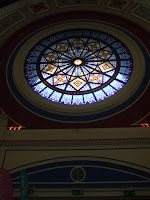 It has the Palm Court at the entrance and lovely stained glass windows letting light onto the main exhibition space. The atmosphere at the Mind Body Soul Experience is far more relaxed and friendly than it was when it was at Olympia in previous years. 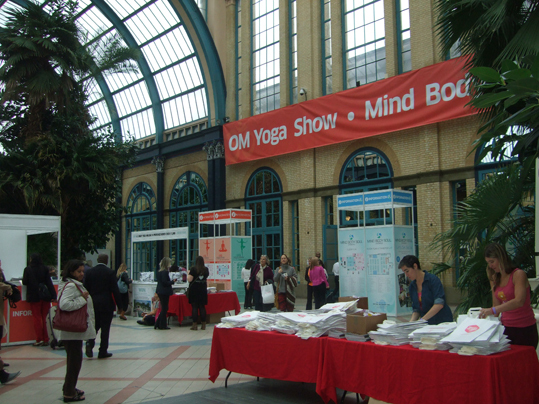 The MBS event runs alongside the Yoga Show and a ticket for one allows free entrance to the other. Both are worth visiting and are on today and tomorrow as well. 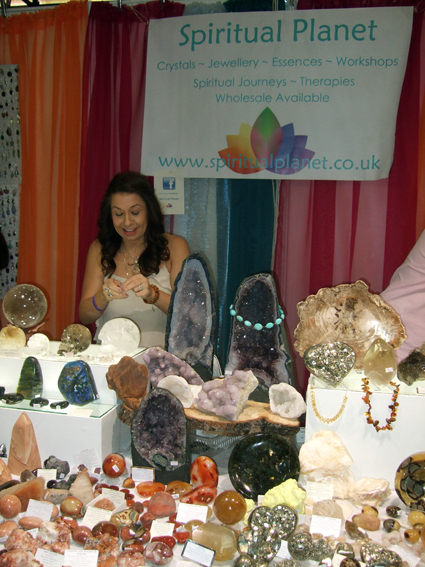 As well as stalls selling all sorts of lovely stuff including crystals, essential oils, skincare products, health food and yoga equipment the main hall has experience areas where you can try out yoga and dance, and a stage offering performances throughout the day. Upstairs there are a few workshop and lecture rooms - all nice and quiet with air-conditioning. Some of them even had lovely views over the park outside. I went to a free workshop called Connect with the Goddess, run by Heather Andrew-Dobbs (pictured right). She talked about seven goddesses who represent different aspects of the divine feminine and then everyone picked a card to find out which goddess they were most connected with at that time. I got Athena, Greek goddess of wisdom. Heather talked about the colours associated with each goddess and saw Athena's colour as being purple. Purple is one of my favourite colours and I know that in ancient times purple was only worn by those of very high status as the dye was rare. 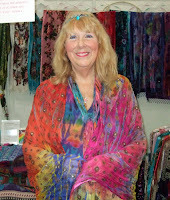 Heather also has a stall at the event, called Everything for the Goddess. 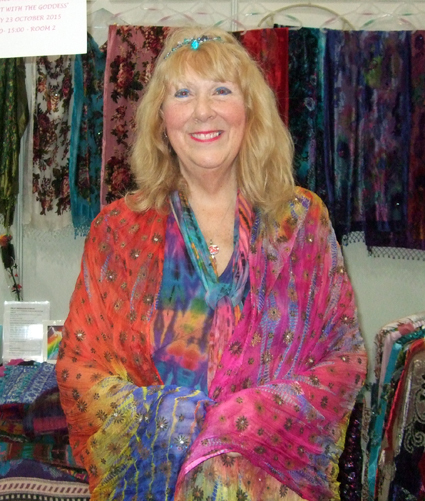 She sells lovely robes and scarves that she specially made. Her idea is that wearing something gorgeous can help you connect to whatever goddess you are working with, especially if you choose something in the colours associated with that deity. I have to say I was tempted and bought a beautiful blue silk robe fringed with gold embroidery. I will happily be wearing it to rituals in future. The workshop I enjoyed most of all though was at the end of the day. It was Reading Tarot as a Psychic, with Kim Arnold. 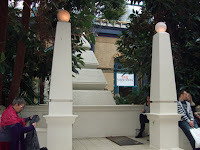 I've reviewed two of her books on my blog - Hay House Basics: Tarot and The Tarot Masters, both of which I thought were very good. I was delighted to meet her in person and get a lesson. We all picked a card and tried to get an impression from it before turning it over, then we teamed up with another person and did a short reading for each other. The general advice was to trust your instincts more when doing card readings. Although many of the workshops and talks are free, some have an extra cost. I paid £5 for Kim Arnold's class, but it was worth it. Thanks for pointing that out. The place has a lovely atmosphere - I remember going to a mind body spirit festival there in the early1970s (must have been one of the first I reckon). I always wish it had stayed there as other venues were not as good. The mind body soul exhibition being there now feels right and I hope it continues to use the venue.